Congratulations! I’m reviewing an eBook today! It’s the first time I’m doing one, so let the good times roll. (Supreme Commander reference, though it may have come from somewhere else). For March, I’m actually going to go with a theme this time around instead of random items. All are books, all are timeslip/time travel books. Good? Okay! For our first week, we’re going to take a peek at The Far Journey. This was an eBook I bought on impulse (okay, not really impulse. But it wasn’t a thought-out, deliberated purchase) while looking for some satisfying time travel stories dealing with the Wild West. I didn’t hit my craving for people from the past ending up in modern times that night, but I found plenty of people ending up in the past. This seemed like more of the hands-on sensible types, so I gave it a go. The story basically follows a very vain, stuck-up high school girl by the name of Paula. She has a click of friends called the Rude Girls, and all of them go about their business falling for guys, picking on people and causing general unrest for their own ends. After pulling a very reckless stunt, Paula is put on a “one more act and you’re out of school” strike. They get handed a report on people moving West and go home. During a BBQ, Paula suddenly gets a dizzying headache, finding herself hurled into the Midwest plains in 1848. She’s now Libby Quarles, a young woman who’s traveling in a wagon train with several people. Thinking she’s been shanghaied and taken to some ranch to fix “erroneous behavior”, this fades quite quickly when she realizes its the real deal. Paula (as Libby) gets exposed to a lot of different experiences, most of them hardships when traveling the Oregon trail. She even suffers through a cholera outbreak in which she tries to help (and isn’t listened to as you would expect). Libby/Paula gets proposed to by a few people and eventually settles with “her” choice of someone she feels is the one for her. When she realizes that she’ll never get back, she decides to settle down and live life to the best of her ability. In honesty I really didn’t read in depth past that point, speed-reading or glossing over most of the romantic development until she did make it back via Libby dying, Paula ending up back in her body when she was whisked away, several years older in the head. She does her report and has an entire personality change, dressing modestly and pushing most of the people she’s around away. During a lecture she has an emotional cry-scene when a photo of the man she loved in the past shows up in screen, causing Mrs. Guthrie (Paula’s arch-nemesis that is waiting to nail her) to expel her for that little episode. Paula vanishes into the unknown, forging papers to do work in Mexico with children along one of her current-period love interests. Some time passes by when Mrs. Guthrie decides to look into what Paula had been going on about, finally realizing that something had happened and Paula traveled to the past. The two finally meet in Mexico, exchange a few lines and go their own ways. Okay, plot is done. Verdict? In general it was a good read for me. I enjoyed the book overall, but it got boring for me very fast when I hit the middle. This would be due to my like for more story development rather than character development. There was plenty of the latter to those who enjoy it. However it became mixed feelings as it went on. In honesty it also felt that the story was just dragged out a bit too long without anything overtly interesting aside from the hardships. When Paula resigned to live in the past, that’s what killed it for me and I started to gloss over the remaining half of the book. Lastly some quirks with the last chapters bug me. It just seems for living a whole life already and having a changed personality, you would think Paula would’ve wised up an had a lot more common sense. Not really so much. She gets expelled over her missing of a husband during a lecture of the Oregon Trail in-class. That was a turn-off. It really was. If I was Dumbledore was heaping review points to Gryffndor throughout the book, I would’ve pulled most of them back at that point. I fully expected Paula to wise up and go through school okay with her new perspective, straightening her life out. Better control over her emotions. No, because of some evil hard-nosed lady who doesn’t seem to recognize emotion or common sense, decides to kick her out thinking randomly crying and mysteriously blabbing people’s names is another stunt. Fault is on both parties here, unfortunately. Even if they made up in the end of the book, the damage from the school was done. That whole bit didn’t seem to follow common sense, and it bugged the heck of out me because of that. I suppose because I was raised to be super-high-context because I’m from an Indian family, I have a different values system and don’t relate to people just being simply careless or not keeping themselves in check. But yes, that’s my final and the end of my review. Okay read, something I probably wouldn’t go out of my way to read again. However aside from that bit, it was all right. I don’t know much about the author, Tom Reppert. Google pulls up minimal information (nor is his website/info in the back of his book, which is a bit of a no-no in my books) but this apparently is his first and only publication so far. He apparently is attempting to set it up as a trilogy, the second book already in the works. I do give him props for writing about a primary female protagonist. The eBook itself is formatted well and done professionally, too. So he has that going for him as well. 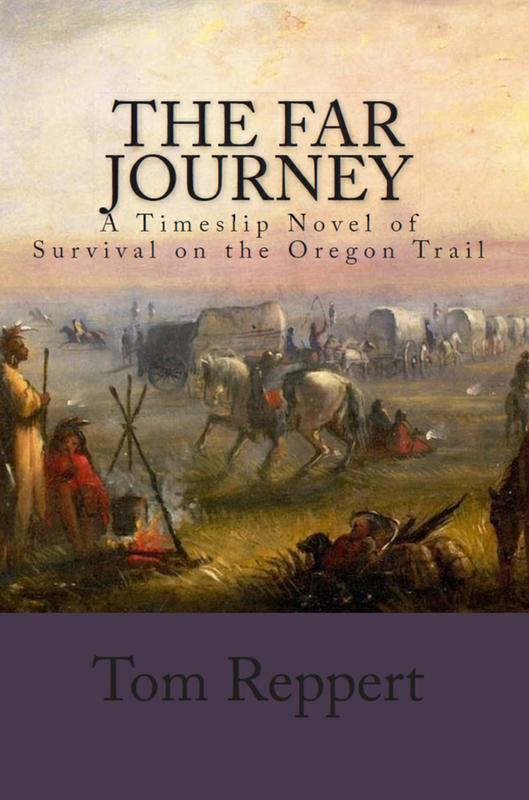 What would I be looking for in another Western time travel story? I’ll probably stick to the more sci-fi looking ones, probably going along the lines of Cowboy vs. Aliens. Of course, I could always make my own one. That’d be a travesty, though. Well…if I wrote one, it’d be like taking Dr. Quinn Medicine Woman and Martian Battleship Nadesico, tossing them in a blender then topping it off with the Homeworld franchise. Adventure with a splash of romance. Or maybe slightly more romance oriented. Heck, maybe I’d even swap the roles around. In Pern Falls, Jeremiah Cox is a young man who can’t find the right woman to marry. The small Western-like town doesn’t hold much promise to him and the elders always seem to keep the town stagnant. His bright ideas cause problems for many and this also doesn’t sit right with most of the crowd. This all changes one day when a massive object arrives, bearing the name Pleiades. They are civilians from Earth who’ve hijacked an Everest-class battleship, fleeing a brewing conflict between the Mars Republic and the Earth Alliance. Tensions are high as the refugees attempt to claim their stake on the world, disrupting life as the people of Pern Falls know it. However none of that matters to Jeremiah. He has met the most beautiful angel, riding from the heavens aboard this metal chariot; a test pilot by the name of Yukari Ako. This lovely woman has the most sultry eyes and the strangest antics, wielding weapons and piloting things called “mecha”. How is he to bid for her love? Find out! And the write-up for that will be another day. Have a great week!